What's behind violent anti-U.S. protests in Muslim nations? 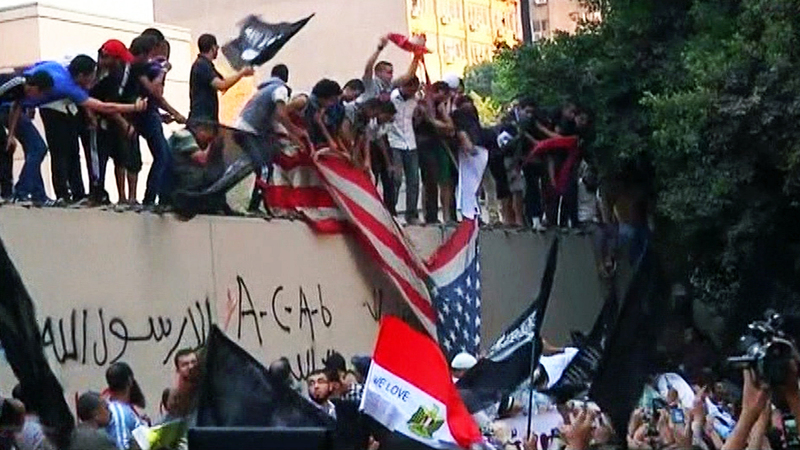 Egyptian protesters at the U.S. Embassy in Cairo, Sept. 11, 2012. (CBS News) LONDON - The FBI and a specially trained team of Marines are on the ground in Libya trying to determine exactly who was behind Tuesday's deadly attack on the U.S. consulate in Benghazi, but the "who" may be less important than the "why". "60 Minutes" correspondent Lara Logan says for the intelligence agencies of the West, what's "important is to look at the ideology that's fueling them ... because it's the same all over the world, with every group that's al Qaeda or al Qaeda-affiliated ... they're driven by a belief that the United States is engaged in a war with Islam." That message may actually be getting harder for the leaders of al Qaeda and similar groups to sell to young Muslim men - even the young, uneducated ones ripe for terror recruitment - as the war in Iraq and the grim images from Abu Ghraib slowly fade into memory and as the U.S. military prepares to pull out of Afghanistan. But recent history across North Africa has created fertile ground, with huge populations of long-oppressed Muslims suddenly finding themselves free to join political movements of their choice, and with regional Salafist Muslim groups quickly achieving levels of power they couldn't have dreamed of two years ago. Men with their eye on power - some of whom have spent much of the last three decades in prison as terrorists - are now eager to sell the message to anyone who will buy it, and they are operating in countries with weak central governments and poorly trained, corrupt security forces. Jonathan Evans, the head of Britain's MI5 intelligence agency, warned in June 2012 that the Arab Spring has by its very nature made parts of the Arab world a "permissive environment for al Qaeda." In this environment, an amateurish online video mocking Islam and the prophet Muhammad, allegedly produced in the U.S., can be all the sales pitch the men trying to prop up the mythical war need. CBS News senior correspondent John Miller says the militants behind the attack on the U.S. consulate remain unidentified, but the focus is currently on two Libyan groups, Ansar al-Sharia and the Abdul Rahman Brigades. These are just two of the militant Islamic groups which have risen to prominence in Libya since the end of Muammar Qaddafi's decades-long reign. Since Qaddafi was toppled by the Western-backed rebel movement about a year ago, the various militias and local militant groups which served as the foot soldiers in that war have become the de facto security forces for their areas. The central government, still a new and untested democracy, wields little power in some areas, particularly the north. In August, after Salafist groups destroyed at least two historical religious shrines, Libyan Interior Minister Fawzi Abdelali essentially threw his hands up and admitted the government was powerless to stop the militants. "If we deal with this using security we will be forced to use weapons, and these groups have huge amounts of weapons," he said. "They are large in power and number in Libya. I can't enter a losing battle." Ansar al-Sharia, which has said it participated in, but did not plan the attack on the U.S. consulate in Benghazi, has such power in the city that the group released photos in August showing its black-clad militants riding in a convoy of vehicles - which look almost like official police vehicles emblazoned with their logo - through Benghazi's streets. According to the statement posted to the group's Facebook page along with the photos, Ansar al-Sharia was taking responsibility for the security of one of Benghazi's major hospitals. Under Qaddafi's iron-fisted rule, Salafist groups were almost powerless, but when he was toppled, they suddenly became more powerful than the central government itself. One of the hundreds of Islamic extremists freed from prison by the rebel brigades during the fighting against Qaddafi's forces was Abu Idris al-Libi. His brother, Abu Yahya al-Libi, had escaped arrest in their native country and fled to the Afghan-Pakistan border region. He became the No. 2 commander of al Qaeda, and held that position until a U.S. drone strike killed him earlier this year in Pakistan. Abu Idris al-Libi, brother of slain al Qaeda commander Abu Yahya al-Libi. Abu Idris (an adopted name, his real name is Abdel Wahab Qayed), now free from prison, has started appearing in online videos at Libyan security conferences, giving statements to reporters as the head of the National Border Guard for southern Libya - an agency run by the new Libyan government's Defense Ministry. According to the London-based Arabic newspaper al-Hayat, Abu Idris al-Libi was elected to the Libyan parliament in July. While there's no evidence that Abu Idris is now connected to the terror group which deputized his brother, he was locked up by Qaddafi and sentenced to death as a senior member of the Libyan Islamic Fighting Group (LIFG). Abu Yaha al-Libi and at least one other former senior member of al Qaeda came to the organization from the LIFG. These Libyan groups and others like them in Syria and across the Muslim world are comprised largely of poorly educated young men, and they pose little direct threat to the U.S. or its interests. Attacks like the one on the U.S. consulate are worrying, but they are relatively limited in scope and represent a localized threat that can be controlled for with bolstered security measures. On Wednesday, however, a U.S. source told CBS News there was also a possibility that al Qaeda in Islamic Maghreb (AQIM), the terror group's North Africa franchise - and, according to CBS News terrorism consultant Jere Van Dyk, it's most well-funded - might have been involved in the attack on the Benghazi consulate. AQIM is of significant concern to U.S. security agencies, and has known links to the Yemen-based branch, al Qaeda in the Arabian Peninsula (AQAP), which has launched several attacks on U.S. interests, including the attempted Christmas Day bombing of a passenger jet over Detroit in 2009. General Carter Ham, head of the U.S. military's Africa Command (AFRICOM), expressed concern in June 2012 that the various Islamic militant groups of North Africa, including AQIM, al Shabaab in Somalia, and the Boko Haram group in Nigeria were linking up to share resources and training. "Each of those three organizations is by itself a dangerous and worrisome threat," Ham said. "What really concerns me is the indications that the three organizations are seeking to coordinate and synchronize their efforts ... That is a real problem for us and for African security in general." There are some worrying parallels between Libya and neighboring Egypt, where militant Islamic groups had been all but neutered under the rule of Western-backed strongman Hosni Mubarak, until he was toppled in his own country's Arab Spring uprising. In Egypt, rebels didn't have to break down prison walls to free Islamic Jihadists as they battled the Mubarak regime. The country's military leaders deliberately liberated dozens of hardline Muslim radicals, hoping the extremists would divide the opposition movement and thus make it easier to control. The move backfired. The conservative Muslim Brotherhood won the nation's first democratic elections in decades and its candidate, Mohammed Morsi, is now the president. The Brotherhood and Morsi himself have vowed to work with the West and have thus far respected the nation's long-standing treaties with Israel, but the far more extreme (and far fewer in number) Salafist Muslims - the militants and extremists who wish to topple democratic governments in Muslim countries and implement Sharia law (many of whom backed Morsi's candidacy) are now freer to operate openly in the country, and to spread the ideology based on a contrived war between the West and Islam. One of those freed by the military before Mubarak was toppled is another man with a very close familial link to al Qaeda. Mohammed al-Zawahiri is the brother of current al Qaeda chief Ayman al-Zawahiri. Mohammed has now emerged as a conservative leader on Egypt's political landscape, fronting the new Egyptian Salafist Jihadi Movement group. He was one of several Salafist figures who called for protests at the U.S. Embassy in Cairo this week, ostensibly against the dubious anti-Muslim video clip which appeared online this summer. While there has been nothing to suggest the U.S. government or any individuals connected to it had anything to do with the production of the vitriolic 15-minute clip on Youtube, Salafist groups around the world have been quick and effective in using it as propaganda to keep selling the narrative of an American war against Islam. The video was a gift to the men who need to keep that belief alive, in order to stake their claim on power in the post-Arab Spring Muslim world.